As I organize multiple pieces of Rosslyn’s renovation, our littoral Adirondack existence, and my still-young marriage into some sort of coherent storyline I wrestle consciously with occasional incongruities between my story and my life. The narrative landscape is vast. Too vast, it often seems, to fit into a tidy memoir beginning with the crisp crack of a book spine opening for the first time, and the contented-sigh closure compelling stories demand. Day after day, week after week I reread and rewrite, sort and distill and sort again, hunting for the essential story lurking amidst a mosaic of daily munge entries; four year’s worth of to-do lists; over fifteen thousand photographs; boxes of technical drawings and hasty sketches; hours of dictation; recorded meetings; and emails. Properly assembled, these miscellaneous artifacts form a multidimensional map of what took place between the spring of 2006 and the summer of 2012, but they fail to tell the story, they fail to recount the adventure lived. In fact, I am startled to discover that these precise, unambiguous reference points frequently contradict my recollection. Dramatic events indelibly etched into my brain at the time have already blurred despite the brief lapse of time. I curse my mischievous mind and then accept that 100% accuracy will inevitably elude me. My mind’s imperfect cataloging at once humbles and liberates me. Though an imperfect historian, I am a chronicler and curator of stories, not facts. Even when my data is unequivocal, I inevitably distort history, omitting and abbreviating and emphasizing, distilling the vast landscape of data into vignettes. These accrete gradually, revealing the narrative design of my story. I am unlike my father and my brother who posses iron vaulted minds where information is deposited, preserved and safeguarded for later use. When the time comes to retrieve the information, they withdraw it from their vaults unaltered, uncontaminated, reliable, accurate. I believe that there are different kinds of accuracy. I am a storyteller, not an historian, and though I strive for verisimilitude, some truths are more effectively preserved and conveyed through stories than history or vaults. Some days I toil like an archeologist amidst a midden heap of artifacts, rewinding time’s mysteries, deciphering the prior summer’s garden vegetables from this season’s rich, dark compost. Other days I seduce and charm and coerce the artifacts to share longer forgotten truths. I plant French radishes and bush beans in the compost-enriched garden and several unlikely seedlings emerge among the radish and bean sprouts. I skip them while weeding, and soon enough I am rewarded with yellow cherry tomatoes, wart covered gourds and a curly garlic scape! Although I’ve grown yellow cherry tomatoes in the past, I’ve never grown gourds or garlic. I remember that we were given several multicolored gourds to decorate my bride’s annual Halloween birthday party last year. But they were smooth skinned. Perhaps they were discarded in the compost, and a recessive wart gene found its way into the germination process resulting in the exotic adaptation growing amidst the fattening radishes. And the garlic? We eat plenty from Full and By Farm, our local CSA, but to date I have never planted garlic. I vaguely remember several bulbs that we left out while traveling last winter. When we returned home, the kitchen was ripe with the pungent odor of rotten garlic. The bulbs were discolored, sitting in a pool of their own brown fluid. Several garlic cloves had begun to germinate, pale green shoots emerging from the cloves and arching upward. I imagine planting them in a terra-cotta pot and placing it on a windowsill in my study. Each morning I inspect their progress. One shoot yellows and grows limp, then wrinkles across the moist soil. The other three grow taller quickly, changing from pale to dark green. Soon they will twist into elegant scapes which I can cut just above the soil level. I will chop them up and sauté them with olive oil, salt and pepper. I will serve them to my bride as a dinner side with mashed potatoes and swordfish, and she’ll smile ear-to-ear, marveling that something so succulent could have grown by accident. According to Garcia Marquez life is not only the experiences, the moments lived. Life is also the rendering of those experiences into stories, the recollecting, the filtering, the imagining, the sharing. To fully live we must share our stories. That’s an interesting notion in a world that more often favors accuracy, facts, history. Perhaps even with history we become overconfident that the facts are irrefutable. Only in recent decades have scholars we begun to look critically at history’s biases, often tainted by ideology, objectives or favoring the victors to the vanquished. Absent an omnipresent video camera that documents my life as I bump along, capturing every minute detail precisely, permanently, Garcia Marquez’s perspective offers reassuring guidance. Though I frequently daydream about a collaborative memoir comprised of the recollections of everyone who participated in the rebirth of Rosslyn, my story is an eclectic nexus of personal experiences, filtered, aggregated and cobbled into narrative cohesion by me. I write these affirmative lines now, and yet I struggle with it each time my bride asks if she can participate more actively in the revising and editing. Yes, I tell her; when I am done. Which is not to say that I have neglected her input. I have sought it again and again. But her story is different from my own, as are the still unwritten memoirs of many creative and hardworking people who invested their time and energy into renovating our home. I hope to showcase many of their impressions and memories on the Rosslyn Redux blog. And I am optimistic that my memoir will serve as an invitation to dig into their memories and to recount their own versions of Rosslyn Redux. 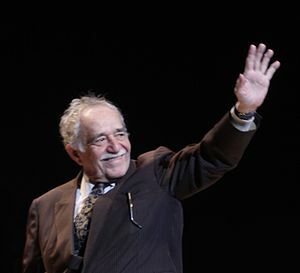 Thank you, Gabriel Garcia Marquez, for your guidance.